MODERN METROPOLIS AMIDST COLOURFUL CULTURES KUALA LUMPUR is a city of delightful contrasts and one of the most vibrant cities in Asia. Visitors will be greeted by the stunning Petronas Twin Towers, a world-renowned icon of the country. The numerous pre-war heritage buildings reflect Kuala Lumpur’s rich past and stand in charming juxtaposition to the modern ambiance. Lush greenery and well-manicured parks lend a refreshing garden appeal to the city. With its colorful potpourri of races and cultures, KL, as the city is popularly known, is a kaleidoscope of fascinating sights and sounds. Immerse yourself in its abundance of attractions – exciting theme parks, world-class sporting events, dazzling cultural performances and entertaining nightlife. 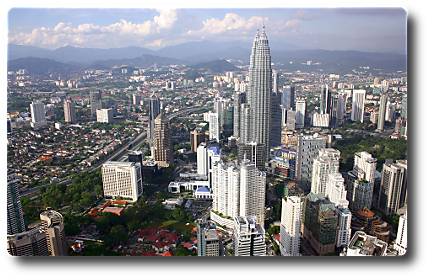 Kuala Lumpur traces its origins to the 1850s when tin prospectors established a trading post here. As the years passed, KL emerged as the centre of commerce in the country. It was made the capital following the country’s independence in 1957. KL’s flourishing growth led to the conferment of city status in 1972. Two years later, on 1 February 1974, the city was ceded to the Federal Government by the state of Selangor and established as a Federal Territory. Today, KL is home to a population of 1.6 million people and is a microcosm of modern Malaysia. English is widely spoken here and visitors can go on organized tours or explore the capital at their own pace. The city boasts a comprehensive transportation network that makes your sightseeing experience pleasant and hassle-free. This guide suggests the nearest or most convenient modes of transport to the various places of interest. Enjoy your visit to this modern metropolis.